The Training Results tab is used to view the progress of the current training and compare several training results. View the training progress information, graph monitor, and log. EPOCH in the training progress information area indicates how many epochs have been completed out of the number of optimization epochs (Max Epoch) for a complete training specified on the Config tab. Elapsed, Remaining, and Total in the training progress information area indicate the time elapsed from the training start point to the current point, the estimated time from the current point to training completion, and the estimated time from the training start point to training completion, respectively. The graph monitor shows the learning curve. 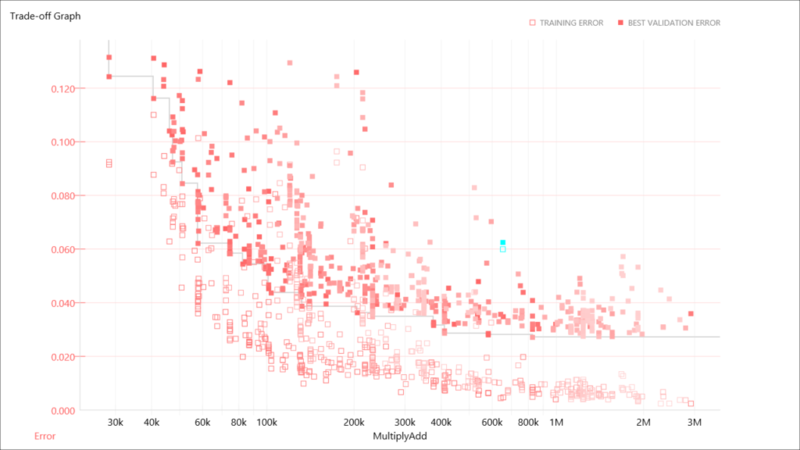 The horizontal axis indicates the number of training epochs, the left vertical axis indicates the cost function of the training data, and the right vertical axis indicates the error function of the training data and validation data. The log shows the log output by the Neural Network Libraries. If an error occurs during training due to an improperly configured learning engine, network inconsistency, dataset inconsistency, training parameter error, or some other reason, you may be able to determine the cause by viewing the log. For details, see the FAQ. Click the Stop Training button. Or, press Shift+F5 on the keyboard. Click Trade-off Graph in the graph setting area. 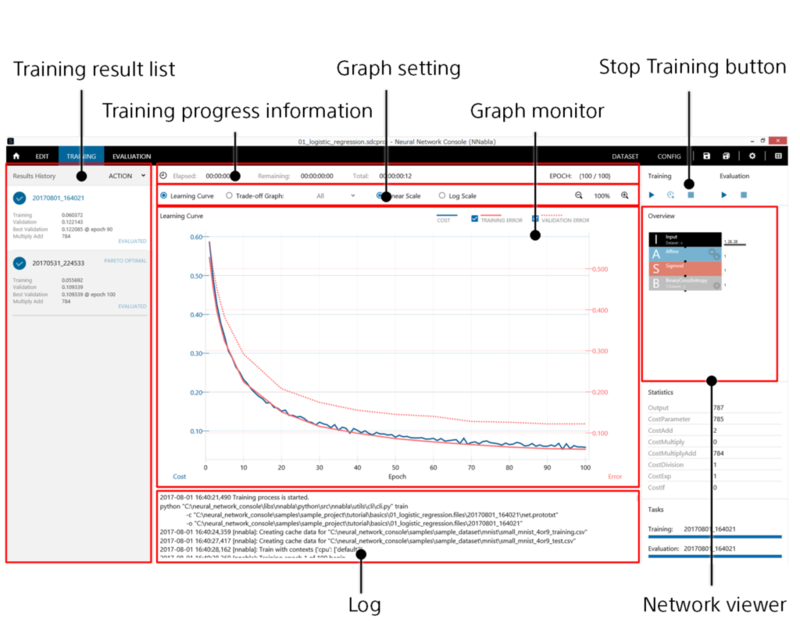 The graph monitor shows a tradeoff relationship graph with errors on the vertical axis, the number of multiplications and additions on the horizontal axis by default, and points representing each training result. 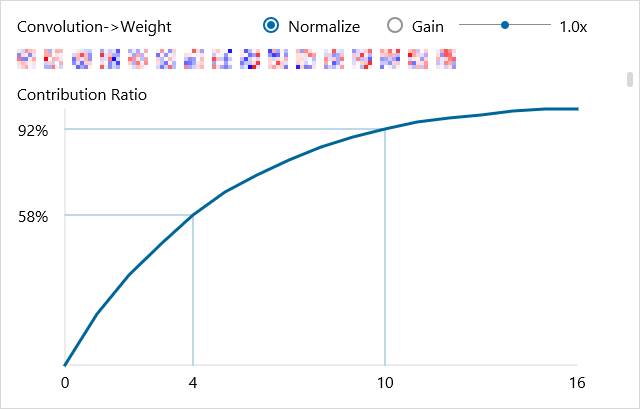 If you select Pareto Only from the combo box to the right of Trade-off Graph in the graph setting area, the displayed data points can be limited to those whose error or number of multiplications and additions exceeds that of all other past training results. If you select Previous from the combo box to the right of Trade-off Graph in the graph setting area, the displayed data points can be limited to those of results earlier than the currently selected training result. Click the Trade-Off Graph horizontal axis label (CostMultiplyAdd by default), and select the one you want from the displayed combo box. On the list of past training results shown in the training result list, click the training result you want to view. Or, click a data point on the Trade-off graph shown in the graph monitor. The contents of the training progress, graph monitor, network viewer, and log are updated for the selected training result. Right-click the training result list to open a shortcut menu, and click Open Result Location. Training result files are stored in a folder with the project file name (without the extension) with “.files” extension and in the folder with a name showing the date and time when the training was executed. On the list of past training results shown in the training result list, click the training result that you want to rename twice. Or, right-click the training result list to open a shortcut menu, and click Rename. Right-click the training result list to open a shortcut menu, and click Refresh. On the training result list, click the first training result. Right-click the training result list to open a shortcut menu, and click Open Learning Curve for Comparison. On the training result list, click the second training result. On the graph monitor under Learning Curve, the learning curve of the first training result is shown with a light line and the learning curve of the second with a normal line. Right-click the training result list to open a shortcut menu, and click Clear Learning Curve for Comparison. Right-click the graph monitor to open a shortcut menu, and click View and then the item to be shown from the following three options. Training & Validation (default) The error function values of both the training data and validation data are shown. Training Only the error function values of the training data are shown. Validation Only the error function values of the validation data are shown. Click Log Scale in the graph setting area. To revert from the logarithmic axis to the linear axis, click Linear Scale. Click the graph monitor to select it. Or, right-click the graph monitor to open a shortcut menu, and click Zoom and then Zoom In or Zoom Out. Right-click the graph monitor to open a shortcut menu, and click Save CSV as. Right-click the graph monitor to open a shortcut menu, and click Save Graph BMP as. The resolution of the saved image will be 1280×720 pixels (fixed). On the training result list, click the training result you want to export in nnp format. Right-click the training result list to open a shortcut menu, and click Export->NNP (Neural Network Libraries file format). An nnp file is generated with the name “model.nnp” in the folder containing the training result file. An nnp file contains descriptions of the neural network structure, training settings, trained parameters, and the like that the Neural Network Libraries handle. Models exported in nnp format can be used through the Neural Network Libraries Python API, command line interface, and C++ command line interface. On the training result list, click the training result you want to export in nnb format. Right-click the training result list to open a shortcut menu, and click Export->NNB (NNabla C Runtime file format). An nnb file is generated with the name “model.nnb” in the folder containing the training result file. An nnb file contains descriptions of the neural network structure and trained parameters that the Neural Network Libraries NNabla C Runtime handles. Models exported in nnb format can be used through the Neural Network Libraries NNabla C Runtime. On the training result list, click the training result you want to export in ONNX format. Right-click the training result list to open a shortcut menu, and click Export->ONNX. An ONNX file is generated with the name “model.onnx” in the folder containing the training result file. Models exported in ONNX format can be used through software applications that support the ONNX format. On the training result list, click the training result you want to export in pptx format. Right-click the training result list to open a shortcut menu, and click Export->pptx beta. On the training result list, click the training result you want to export in html format. Right-click the training result list to open a shortcut menu, and click Export->html beta. On the training result list, click an incomplete training result. Right-click the training result list to open a shortcut menu, and click Force Complete. One of the uses of this function is to make evaluation execution possible for a network whose training has been aborted before completion. On the training result list, click the training result that you want to retrain. Right-click the training result list to open a shortcut menu, click Retrain (in place) (to overwrite the selected training result folder) or Retrain (not in place) (to create a new training result folder and save the training result there). If you select in place, click OK in the training execution confirmation dialog box. Right-click the training result list to open a shortcut menu, and click Retrain All (in place). In the training execution confirmation dialog box, click OK.
All existing training results are overwritten with new training results. On the training result list, click the scheduled training task you want to cancel. Right-click the training result list to open a shortcut menu, and click Cancel Schedule. Right-click the training result list to open a shortcut menu, and click Cancel All Scheduled Task. Right-click the training result list to open a shortcut menu, and click Resume Scheduled Task. On the training result list, click the training result you want to delete. Right-click the training result list to open a shortcut menu, and click Delete from Disk. In the deletion confirmation dialog box, click OK.
Right-click the training result list to open a shortcut menu, and click Delete All Incomplete Results from Disk. When you perform this operation, the training result is deleted directly from the disk without going through the recycle bin. Click the network switch button at the upper right of the network viewer. 1. On the training result list, click the training result containing the network you want to view the parameters of. 2. On the network viewer, double-click the layer that you want to view the parameters of. Or, right-click the layer that you want to view the parameters of to open a shortcut menu, and click Plot Weight. The graph monitor shows the visualized parameter and the parameter contribution ratio determined from the principal component analysis results of the parameter. The horizontal axis of the contribution ratio graph indicates the number of dimensions of the parameter and the vertical axis the accumulated contribution ratio. Drag the scroll bar shown at the right of the graph monitor. Or, rotate the mouse wheel. Or, right-click the graph monitor to open a shortcut menu, and click Zoom and then Default. Select the Normalize check box. Drag the Gain slider horizontally. On the training result list, click the training result containing the network structure you want to open. Right-click the training result list or the network viewer to open a shortcut menu, and click Open in EDIT Tab. The network structure shown on the network viewer is opened in the edit tab. Right-click the training result list or the network viewer to open a shortcut menu, and click Open in EDIT Tab with Weight. The network structure shown on the network viewer of the edit tab is opened with trained network parameter files entered in Convolution, Affine, and other weights (W.File) and biases (b.File). On the training result list, click the training result containing the folder that you want to start the command prompt in. Right-click the training result list or the network viewer to open a shortcut menu, and click MoreTools->Command Prompt.